"Physicians today are overburdened with the vagaries of their electronic health records, endless reporting requirements, and the demands of multiple payors. The amount of time that they are spending with patients continues to dwindle, and the last thing that they want to do is spend additional time, meeting yet another set of requirements that they find burdensome. Unfortunately, Dr. Puffer couldn't bring himself to admit that the costs for MOC are excessive, both in fees paid and the time required to perform this unproven exercise, and he failed to call for an complete moratorium on the unnecessary MOC requirement for the many family medicine diplomates his organization certifies. Instead, he glowingly reviews the survey's "methodological approach," "meticulous design" and "rigorous analysis of the data," despite the survey being designed by an American Board of Medical Specialties (ABMS) employee and reviewed by a mysterious "anonymous external reviewer" (see Acknowledgements). As a result of the survey findings, he calls on "modifications" to MOC because the results of the survey represent the "canary in the coal mine" of how physicians will accept the current iteration of the MOC physician re-certification "quality" metric going forward. But by merely disclosing that he is an employee of the American Board of Family Medicine (ABFM) in the Mayo Clinic Proceedings editorial, Dr. Puffer carries his own canary into the hallowed financial walls of the ABFM's MOC gold mine. It should come as no surprise for readers of this blog that MOC has opened all sorts of wondrous financial opportunities for the ABFM (and all of the member boards of the ABMS) at practicing physicians' expense. For instance, while the public only has access to the ABFM's tax forms to disclose the financial dealings of the organization, we quickly see that MOC continues to be a windfall for the ABFM. In fact, in 2014 MC-FM fees (the ABFM's MOC program equivalent) contributed 46.4% ($12,776,905) of their $27,525,430 annual haul from ABFM diplomates. 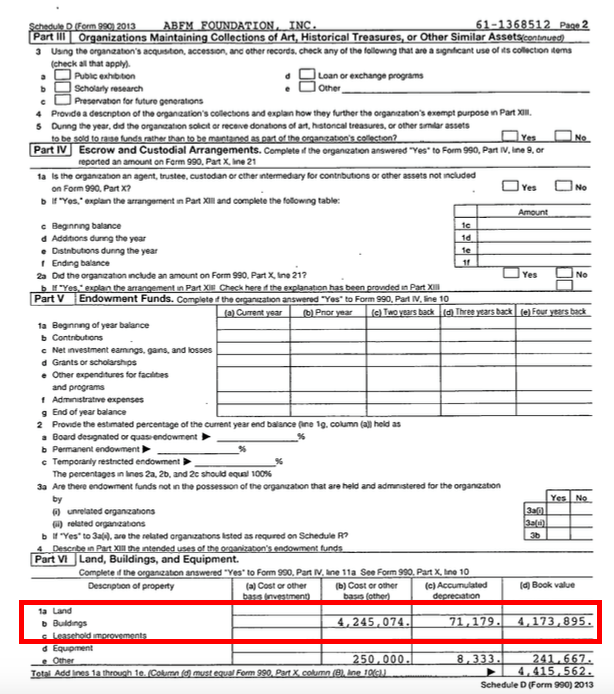 These fees helped support Dr. Puffer's $803,687 annual compensation and the organizations' $3,521,629 "donations" made to their "ABFM Foundation" and "Pisacano Leadership Foundation." (In 2012 and 2013 these "donations" were even larger: $6,147,376 and $7,878,535 respectively). MOC also helped fund the ABFM Executive's first class and companion air travel and their Directors' first class air travel and a $1,449,525 retirement package with $435,000 in post-retirement medical benefits. No wonder MOC is such a great deal and needs to continue! The ABFM is a tax-exempt 501(c)(6) tax-exempt organization that has accumulated a remarkable $130,082,516 in assets on the backs of working physicians that is offset by "liabilities" that fund the salaries of 75 people and other "projects" in the amount of $45,838,832 yeilding a net asset balance of $84,243,684 at the end of 2014. Rather than offset the fees that diplomates have to pay the ABFM for MOC, these fund transfers show the ABFM would rather continue to plow this money into itself (rather than defraying costs to its members) by growing its supporting "Foundations." But careful review of the ABFM Foundation's tax forms shows it carries many similarities to the infamous ABIM Foundation that gained considerable notoriety after its condominium purchase (complete with a chaueffer-driven town car) was disclosed on these pages and elsewhere. According to the ABFM Foundation's most recent IRS Form 990, it exists for the "Fostering of Education and Scholarly Analysis or Research in Family Medicine." 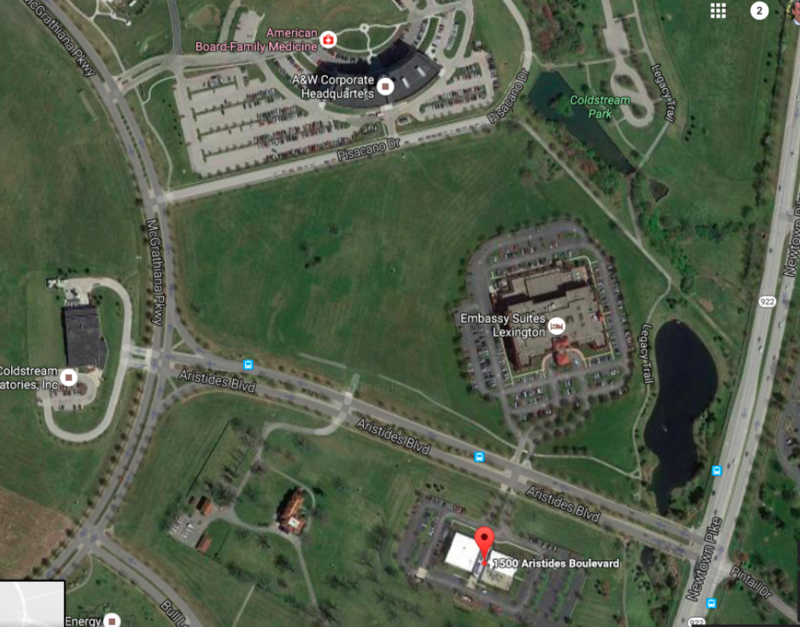 Like the ABIM Foundation, it seems that "scholarly analysis and research in family medicine" actually involves (in part) managing potentially lucrative real estate investments for themselves. 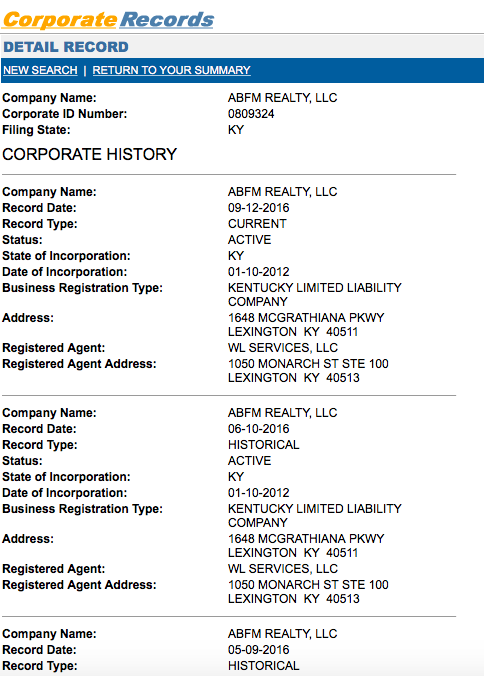 The ABFM Foundation is the controlling entity of ABFM Realty LLC (created in 2010) and ABFM International LLC (created in 2013), both based at the ABFM's office in Lexington, KY and lead by Dr. Puffer. 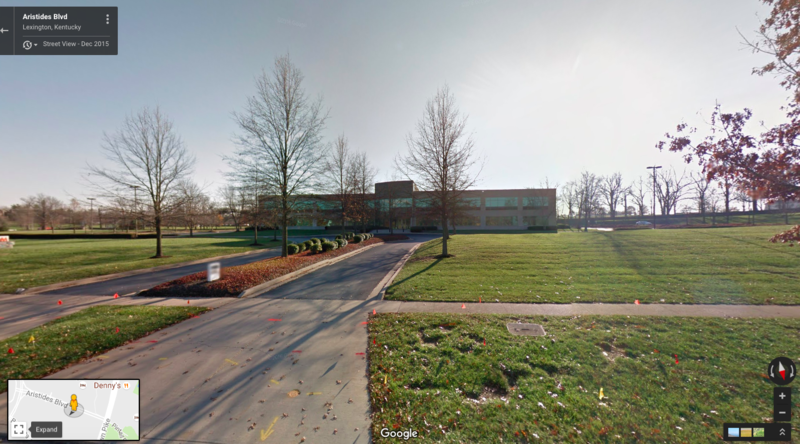 According to tax records, ABFM Realty LLC purchased a 22,793 square-foot office building (pictured here and whose location relative to the ABFM corporate headquarters is pictured here) at 1500 Aristides Blvd in Lexington, KY for $4,245,074 on June 26, 2012 from the $6,147,376 (page 11, Line 24a) of diplomate fees "donated" by the ABFM to its Foundation that year. 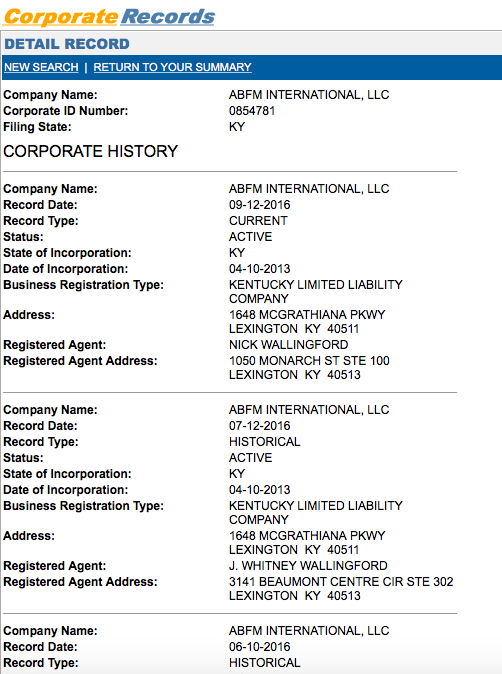 It appears this transaction happened about the time a large law firm, Bingham McCutchen planned to move hundreds of its employees to Lexington, KY the same year. 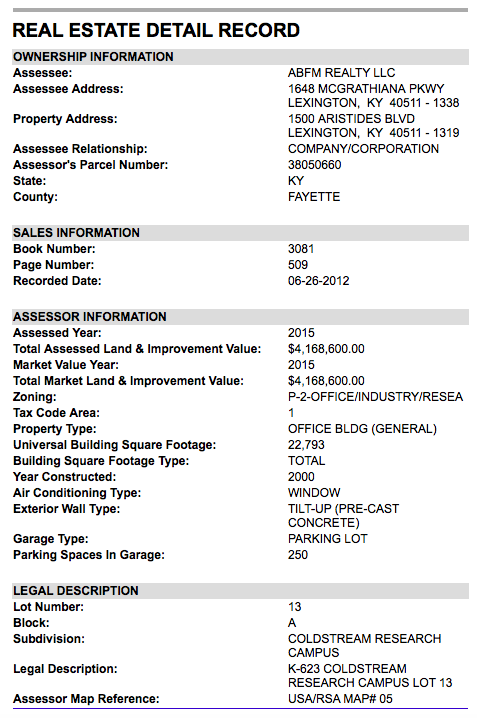 The deal was consumated by a promise of $6.5 million in tax breaks from the Kentucky governor and anticipated revenues of $22.5 million over 10 years in rent and building improvements. Unfortunately, it seems Bingham was struggling financially and was "absorbed" just two years later by Philadelphia's Morgan Lewis and Bockius LLP law firm. 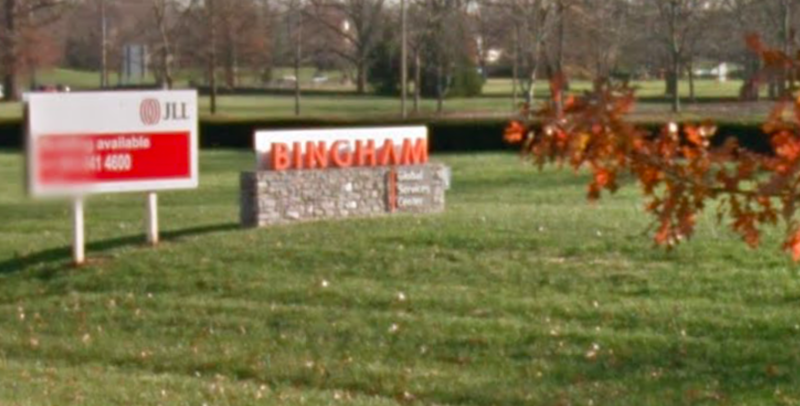 Google's street view still shows Bingham's Global Services Center sign outside the ABFM's building as late as December, 2015. 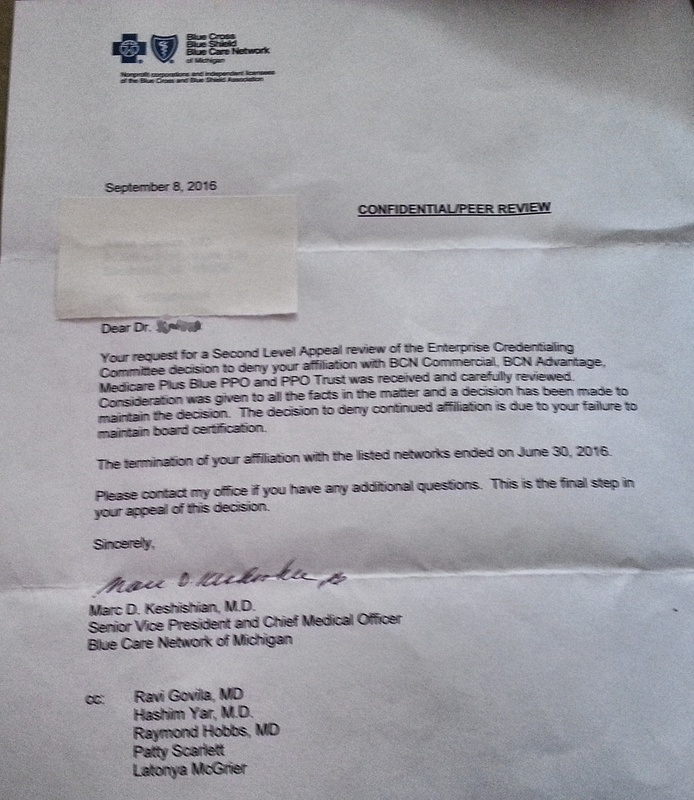 What this loss meant to the ABFM (and its many diplomates) is unclear, in part because to the best of my knowledge and belief this transaction was never been disclosed to ABFM's practicing physicians. Roger Bean, the Chief operating officer for ABFM at the time, "couldn't be reached for comment" either. Here we are in late 2016 and the 2015 tax forms for the ABFM and the ABFM Foundation still have yet to be disclosed publicly. Perhaps their recent real estate snafu explains why these forms aren't available and why the ABMS still feels compelled to continue the highly conflicted ABMS MOC program publicly in the Mayo Clinic Proceedings. Or maybe Dr. Puffer is positioning himself as the heir apparent to the ABMS now that Lois Margaret Nora, MD JD has announced the end of her tenure at the organization. One thing's for sure: with his editorial Dr. Puffer's own canary in the ABFM's MOC gold mine just died and many more US family physicians are now officially on notice. Are Hospitals Hurting Their Physicians? I am trying to find physicians in FL who have unfairly lost ABMS certification and as a result have been unable to find reasonable positions in Medicine. I am a radiologist certified by ABR in 2002, the first year to require 10th year (re)certification. I lost my contract with a hospital in 2010 and took locums positions as I could find them after that. 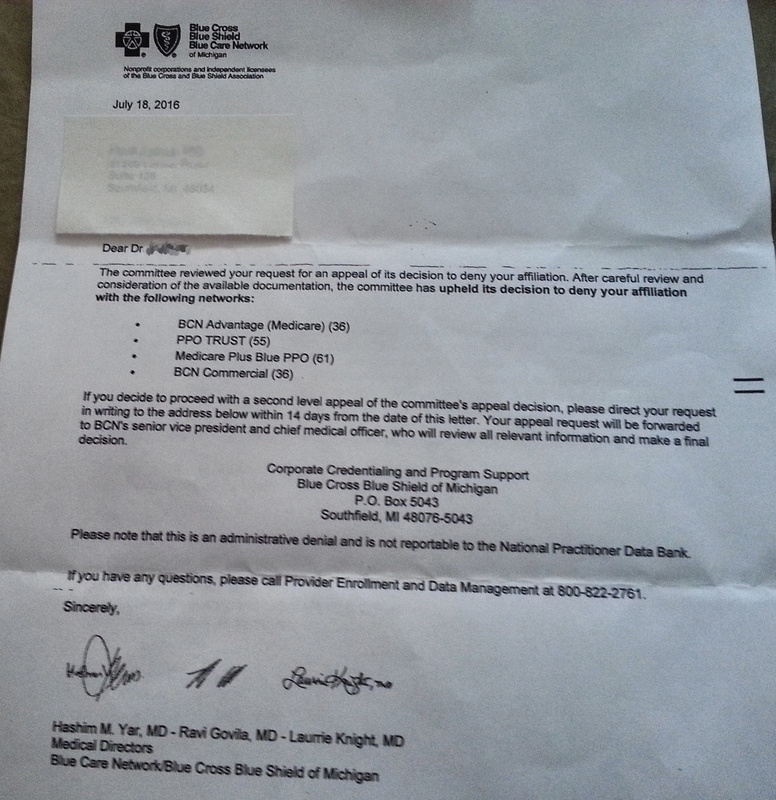 I have passed the recertification exam, for which I paid $2000, but because of short term locum positions, was not able to complete PQI requirements and consequently lost my certification. Now, unless I sign a promise to never sue the board (emphasis mine), I cannot even sign into my page on the ABR website to see my status. Since losing the certification the only work I have been able to find is a bottom-feeding imaging center where I earn less in a year than the MRI and CT technicians, while working 55-hour work week with no more than 3 unpaid weeks of vacation per year. I am certified by the National Board of Physicians and Surgeons thru March of 2017 but this is not recognized by most locations. I was turned away at the door when I drove to NC after being invited to interview for a position. The reason -- the certification I had was not recognized except for by a handful of places. It appears the ABMS Maintenance of Certification (MOC) recertification requirement is creating the situation where capable, experienced physicians are losing their job on the basis of this unproven "quality" metric. I am sure similar stories are occurring elsewhere. There are only about 809,845 US physicians active in patient care nationwide. Many of these board-certified physicians, formerly a lifetime credential, are now receiving letters from their hospital credential committees insisting they recertify thanks to a unilateral rule change implemented in 1990 by the ABIM strictly for their financial benefit. Why would hospitals (who need physicians to staff their hospitals) do this? As usual, I believe it's about the money. Many physicians are employed by hospitals that help train medical school graduates in their specialty. To do so, their post-graduate training program must be accredited and approved by the Accreditation Council on Graduate Medical Education (ACGME). Hospitals that are not ACGME "approved" cannot receive additional Medicare revenue for training these residents in medicine. The ACGME (and Joint Commission) accreditation process requires program directors to be ABMS board certified. And wouldn't you know: both the ABMS and JCAHO are member boards of the ACGME. Appropriately experienced and trained physicians should have the right to work without having to pay into a corrupt system that funnels their money toward non-clinical executives' lavish salaries, luxury condos with chauffeurs, first class airfare, health club fees, and other delightful creature comforts, including world travel. I believe hospitals would be wise to side with their practicing physician staff on this issue. Don't hospitals need these experienced physicians to staff their clinics and to do the necessary work of training residents and caring for patients? Or do they just plan to hire less experienced (but cheaper) program directors instead? What would such a move mean to tomorrow's caliber of physicians? How long before the growing frustration of residency training program directors swells to the point that they refuse to participate or just retire early? I would hope that the leadership in the American Hospital Association (AHA - another member board of the ACGME) is considering these issues. Physicians unjustly targeted should come forward and join the AAPS anti-trust suit already filed against the ABMS. And currently employed physicians who have not yet had to endure this hassle should work with their Medical Executive Committees to incorporate alternatives to the ABMS MOC program in their hospital bylaws now. Each state can do this, and it just takes one dedicated physician at a time to move the needle. Kudos to Dr. Fernley.